A team led by Tom Gower examined the extent of fire damage in Manitoba from 1948 through 2005 to determine both what factors were influencing fires and how much carbon dioxide was being emitted from the fires. Researchers have long wondered what role forests play in the carbon cycle — whether forest fires produce more carbon dioxide than the trees capture. Now, two recent studies say that the matter is not that straightforward: The relationship between forests and carbon dioxide emissions is complex, researchers say, and scientists must convey that complexity to policymakers who are considering carbon dioxide mitigation and forest policies. Both studies suggest, however, that fires can release more carbon into the atmosphere than the forest can capture and that this may be a growing problem. When much of Southern California was burning in late October, one of the questions that arose was how much carbon dioxide those fires were sending into the atmosphere. Every year, fires burn 3 million to 4 million square kilometers of Earth’s land surface area, and release more than a billion tons of carbon into the atmosphere in the form of carbon dioxide. However, massive old-growth northern latitude forests are also considered a carbon "sink," because older trees are repositories of decades or centuries of carbon and because the heavy canopy they produce blocks sunlight from reaching the forest floor and decomposing the forest litter. In the natural system, after a fire, new vegetation moves into the burned land and over time reabsorbs much of the carbon dioxide that the fire had released. Such new vegetation stores the carbon as organic matter. For this reason, some people have suggested planting trees as a way to remove carbon dioxide from the atmosphere. Eventually, however, those trees decompose or burn, thus returning carbon to the atmosphere. Left alone, terrestrial and atmospheric carbon stay relatively in balance, researchers say. However, large or more frequent fires, as can be exacerbated by warming temperatures and changing precipitation levels, can change that carbon balance. In a study published Nov. 1 in Nature, S. Tom Gower and Ben Bond-Lamberty, forest ecologists at the University of Wisconsin at Madison, and colleagues examined fires in 1 million square kilometers of forest area in central Canada that had occurred over the past 58 years. They modeled the forest’s changing carbon balance using historical records of fires in the area and records of changes in carbon dioxide and climate. They combined that information with satellite imaging of the varying species and density of trees, and other details about the forest, such as soil composition, taken from existing databases. They found that of three variables they modeled — climate change, change in overall atmospheric carbon dioxide and fire — the factor that had the biggest impact on the overall carbon balance was fire. 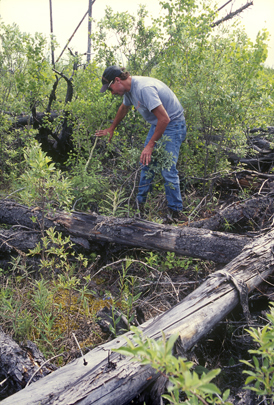 When fire destroys an area of forest, it forces the forest to start over. It sweeps away everything, including the old generation trees. The trees and plants that move in after a fire are often different species than the ones they are replacing, and the new, immature forest is not an immediate carbon sink. Furthermore, thinning the canopy can allow more sunlight to peak through, which speeds up decomposition and thus releases more carbon dioxide. Gower and Bond-Lamberty also found that the incidence and severity of the fires in the northern forest had increased over the period they were studying. It increased most markedly in the final 10 years of their study period, 1996 through 2005. The increasing frequency of fires was shrinking the old growth forest areas and replacing them with younger forests. “We found that parts of the forest had gone from a carbon sink to a carbon source,” Bond-Lamberty says. Younger forests do absorb carbon dioxide from the atmosphere, but they are not the same strongholds of carbon storage that older forests are, he says. Gower and Bond-Lamberty added that climate change itself does not directly affect a forest’s carbon balance, but continuing climate change will ultimately lead to repercussions, they say. “[T]he fire regime is driven by climate, and climate is affected by rising carbon dioxide, and that’s affected by increases in fossil fuel combustion,” Bond-Lamberty says. In another study, published in Carbon Balance and Management Nov. 1, Jason Neff at the University of Colorado at Boulder and Christine Wiedinmyer at the National Center for Atmospheric Research in Boulder looked closely at the amount of carbon dioxide emitted by forest fires in the lower 48 states. They wanted to estimate the contribution of forest fires to the total carbon dioxide emissions for any given state or region. These estimates, the researchers say, would be useful to monitors of carbon dioxide output and to policymakers who need to know all of the different sources of carbon dioxide and which sources they must focus mitigation strategies on. From 2002 to 2006, Neff and Wiedinmyer used two NASA satellites to locate fires and gather data about the affected areas, such as what kinds of trees were burning, how much of the area was forest and how much was bare land. They found that in some regions, such as the western states, fires are becoming more frequent and severe. They attributed this trend in part to local year-to-year variations. But they say that the main reason fires are expanding — and thus releasing more carbon dioxide into the atmosphere — is probably fire suppression. To suppress a forest fire, large crews of firefighters create long gaps in the trees (called firebreaks) to stop the fire from progressing. In the United States, fire suppression has been commonplace for the past 100 years for reasons of self-preservation. More and more people have moved into forested areas, putting yet more homes and lives at risk. Keeping a fire suppressed means keeping it away from those homes and lives. Recently, however, some experts have begun advocating fire suppression as a way to reduce the carbon dioxide in the atmosphere. Fire suppression preserves trees, and trees absorb carbon dioxide. Protecting forests from fire could thus be attractive to policymakers, Neff says. It is not that different from offset programs, many of which plant or regrow forests to help absorb that much more carbon dioxide. Policymakers have options in approaching carbon dioxide emission reductions, but promoting and protecting forests would seem fairly inexpensive, he says. Policymakers might think, “We could all drive Priuses, or we could try to increase forest growth to take carbon dioxide out of the atmosphere,” he says. But, he warns, protecting and growing forests is a tradeoff. Fire suppression protects forests from burning, but at the same time, increases the fuel supply for the next fire that will inevitably happen. Although carbon dioxide from forest fires is a small fraction of the carbon dioxide produced by burning fossils fuels, it's still an important issue to study, the researchers of both studies say. Fires do not cause or even significantly contribute to climate change, says Brian Amiro, head of the Department of Soil Sciences at the University of Manitoba, who designed models that influenced both studies. “Industrial emissions are the real problem.” Still, he says, “analyses like these are important.” They demonstrate that the carbon balance cannot be reduced into a simple matter of cause and effect.